SUMMARY: We report the usefulness of Guglielmi detachable coil (GDC) embolization by direct carotid puncture for anterior circulation aneurysms. For all 27 patients, GDC embolization by direct carotid puncture was safely performed by using a 5F sheath introducer 5 cm long and a Tracker-38 catheter. Neurologic deficits and hemorrhage were not found in any patient during the follow-up period. If the transfemoral approach cannot be applied, GDC embolization should be considered as an alternative method. Lately, embolization for intracranial aneurysm by using Guglielmi detachable coils (GDC, Target Therapeutics, Fremont, Calif) has had a favorable outcome.1–3 The International Subarachnoid Aneurysm Trial (ISAT) Collaborative Group described significantly better outcome with endovascular coiling than with surgical clipping in terms of survival free of disability at 1 year.4 Coil embolization should be especially beneficial for elderly patients.5 However, the transfemoral approach is sometimes impossible in patients with severe systemic arteriosclerosis because of the presence of thoracic aortic dissection and severe tortuosity of aortic arches, the brachiocephalic artery, and the cervical carotid artery. Although an approach through or by making use of the brachial artery can be used in some patients,6,7 an approach from the cervical artery can be performed in patients who have thoracic aortic dissection. We report on GDC embolization by direct carotid puncture and its usefulness in such patients. We performed GDC embolization for intracranial anterior circulation aneurysm in 406 patients between March 1997 and August 2005. Embolization with a transfemoral approach could not be performed in 27 patients because of the presence of severe tortuosity of the aortic arches and the cervical carotid artery in 23 patients and thoracic aortic dissection in 4 patients. The average patient age was 79.9 years (age range, 65–89 years). The size of the aneurysm was 3–20 mm. The aneurysm was located in the anterior communicating artery (AcomA) in 9 patients, the ophthalmic artery portion of the internal carotid artery (ICA) in 5 patients, the posterior communicating artery portion of the internal carotid artery (ICA-PC) in 10 patients, and the middle cerebral artery (MCA) in 3 patients. 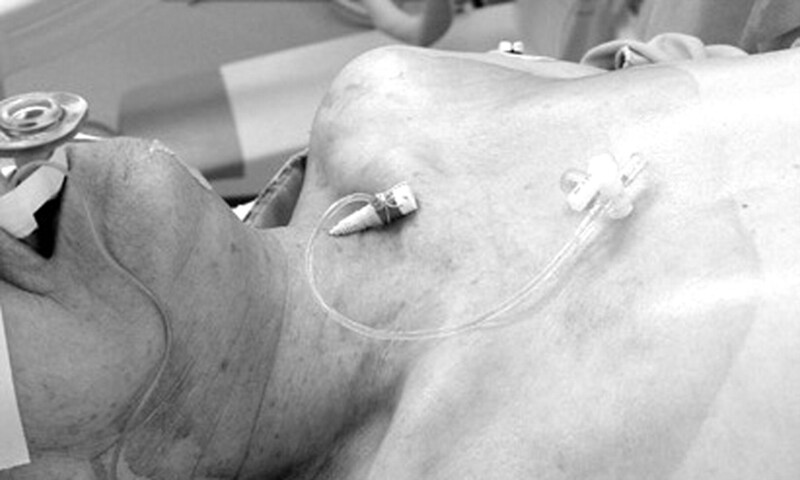 Photograph taken during the operation showing the direct insertion of a 5F sheath into the common carotid artery through the skin. After the CCA was punctured percutaneously, a 5F sheath introducer of 5 cm was placed in the origin of the ICA. Tracker-38, as a guiding catheter, was inserted in the petrous or cavernous portion of the ICA. A microcatheter via Tracker-38 arrived in the aneurysm. An 84-year-old woman with subarachnoid hemorrhage was referred to our hospital. She had a history of surgery for thoracic aortic dissection with a graft. The 3D CT angiogram disclosed a 3-mm AcomA aneurysm. Because a 6F guiding catheter could not be passed through the stenosis at the anastomotic site, we performed GDC embolization by direct puncture of the right CCA and achieved complete embolization. No new neurologic symptoms developed, and no new ischemic lesion was detected by DWI. A 79-year-old man with right oculomotor paralysis from a 9-mm right ICA-PC aneurysm was referred to our hospital. Angiographic examination revealed severe arterial tortuosity in the portion from the aortic arch to the carotid artery, and a catheter could not be inserted into the ICA. We, therefore, performed GDC embolization by direct puncture of the right CCA. Complete embolization was achieved, and no new neurologic symptoms developed. Heparinization (15 000 UI/day) was initiated after the operation. However, swelling in the right cervical region was noted in association with dyspnea, approximately 20 hours after the operation. Doppler sonography and cervical CT disclosed the formation of a pseudoaneurysm with blood flow from the CCA (Fig 3). After endotracheal intubation and termination of heparin administration, manual pressure hemostasis was performed for 5 hours. Thrombotic change in the aneurysm and closure of the blood flow were confirmed by sonography. After the improvement of cervical swelling on the following day, intratracheal intubation was removed. The patient showed no neurologic deficits and was discharged 5 days after the operation. The right oculomotor paralysis was completely improved 2 months after the operation. 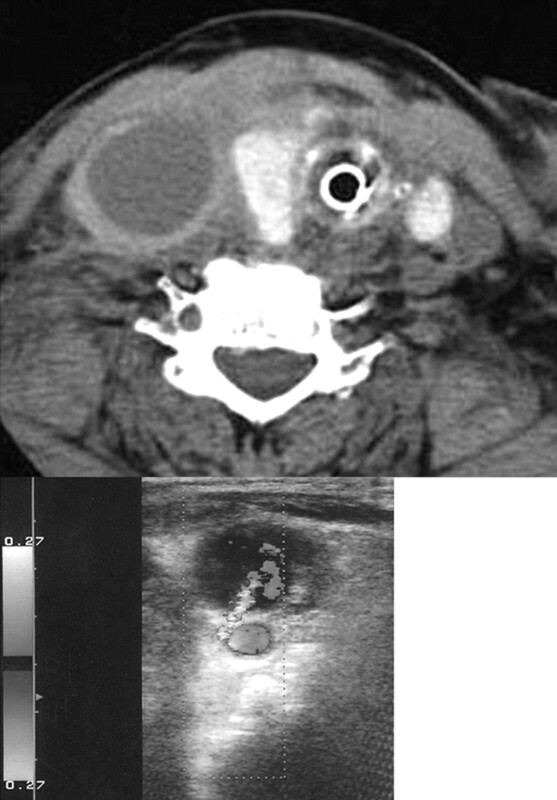 CT image of cervical region (top). Doppler sonogram (bottom) illustrates blood flow from the carotid artery to the subcutaneous hematoma. Patients’ characteristics are summarized in the Table. No neurologic deficits were found in any of the 27 patients, including the patient who developed a cervical subcutaneous hematoma. DWI, performed in 17 patients on postoperative days 2–5, revealed the development of a high-intensity area in 7 patients (3/7 who underwent systemic heparinization and 4/10 who did not). The average follow-up period after the operation was 26.4 months (range, 2–62 months). No hemorrhage was found in any of the patients during the follow-up period. Patient No. 1 died from thoracic aortic dissection, and patient No. 18 died from myocardial infarction. We normally pay particular attention to the following 2 points to perform this procedure safely and accurately. One is to use a short sheath and the other is to use a guiding catheter. Because the normal carotid bifurcation is located approximately at the level of the 4th cervical spine,9 puncture of the CCA should target the lower level of the cervical vertebra. When a 5-cm sheath is inserted from this puncture site, the distal edge of the sheath can be stably placed at the origin of the ICA, which is curled and snakes rearward. When a sheath longer than 5 cm is used, it is likely to cause severe tortuosity in the ICA. It is possible to place a microcatheter into the aneurysm through a sheath.10 However, insertion of a microcatheter and a coil can be performed smoothly when a guiding catheter via the sheath is placed in the distal portion of the ICA. This would also help prevent the dissection of the intima of a vessel. Moret et al11 reported that a microcatheter could not be inserted into 4 AcomA aneurysms (11%) associated with arteriosclerosis. 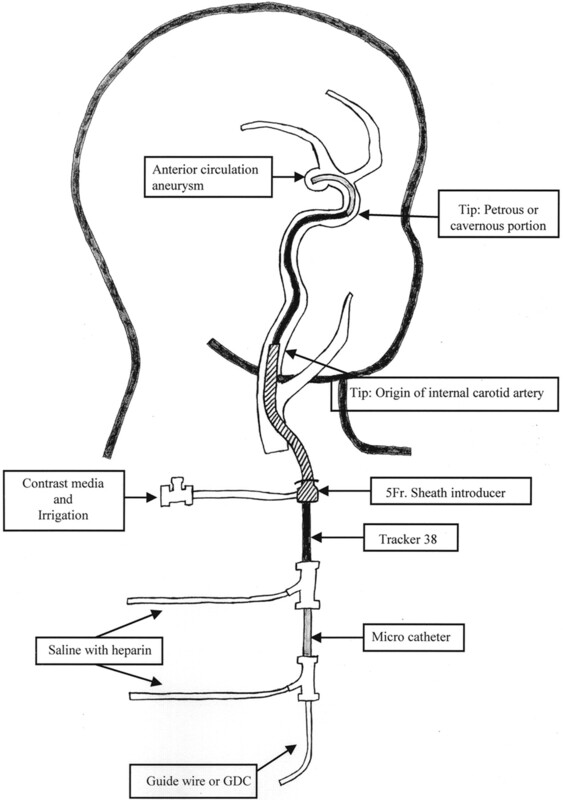 However, we could accomplish embolization in 406 anterior circulation aneurysms, including 153 AcomA aneurysms. Although we abandoned the use of systemic heparinization when the patients experienced postoperative hematoma formation in the neck, thromboembolic complications did not develop and the frequency of the new ischemic lesions on DWI was not significantly different in the presence or the absence of systemic heparinization. Regardless of use of systemic heparinization, the frequency of the ischemic lesions on DWI with this procedure (41.2%, 7/17) was not significantly different from other approaches (44.9%, 102/227). Systemic heparinization after the operation would not be necessary in patients who do not develop dissecting regions as a result of cervical arterial puncture and in whom GDC embolization is favorably performed. When a hematoma occurs at the puncture site, immediate intratracheal intubation and hemostasis are required.12 We recommend using guidance for the carotid puncture, which might add some safety and avoid injury to the surrounding area. We also recommend that angiography via femoral access after hemostasis be performed to exclude a dissection or pseudoaneurysm in patients who would benefit from postprocedural heparinization. Accepted after revision March 2, 2006.